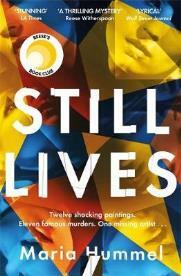 Still Lives comes pretty close to achieving the illusive status of smart thriller. Many novels claim to be that (or the dust jackets do), few get there. Hummel’s Los Angeles-set story plays out against the backdrop of the high-stakes and high-dollar modern art scene. Our heroine Maggie Richter works at the fictional Rocque museum, which bears many similarities to the real Getty Museum of Los Angeles. A frustrated journalist, Richter scribbles breathless copy for the Rocque’s publicity machine. She is a rigorous copy editor and proud of her pedantry. The story starts on the day the Rocque is presenting a show by one Kim Lord. The feted Young American Artist has painted eleven tableaus based on actual murders of women in the U.S. —Nicole Simpson and the Black Dahlia all get the Lord treatment. The artist paints versions of herself as these notorious victims. Is it a statement about violence against women, or an attempt to immortalize the women? Or simply a hook for Lord to gain maximum praise and mucho dollars? All three? More? Plenty of people try to answer those questions but Lord is not one of them. In a brilliant set piece Hummel shows us the managed craziness of opening night at the gallery. The socialites in Gucci sweep into the museum, waiters scurry to dispense champagne and nibbles and Roque’s underground worker bees complete last-minute preps. And many in the Rocque community chew their nails, check their phones and inhale cigarettes. This because Lord is AWOL, gone, disappeared, unresponsive, off-grid. The questions swirl — is Lord’s absence part of the Still Lives series or did she simply choose to do a Jay Gatsby and skip her own party? Complicating matters for Richter, Lord’s fiancé one Greg Shaw Ferguson, is on the scene and as panicky as everyone else. In a twist (for which a small amount of disbelief must be suspended) Shaw Ferguson’s previous girlfriend is one Maggie Richter. The break-up did not go well and Maggie has a lot of baggage to park if she wants to help Greg uncover the reasons behind his girlfriend’s disappearing act. The cops beat the young people to it on finding the grisly remains of the artist in L.A. Both reluctant and intrigued, Richter pursues several avenues and ultimately helps L.A.’s finest figure it out. All this while trying to keep her feelings for Ferguson Shaw in check. Richter is an appealing heroine, whip smart, lonely, self-deprecating. As is de rigueur for private dicks, she carries with her guilt and trauma from events several years before in her home state of Vermont. What really stands out though is that Richter is well-read and politically aware. She paints herself as a bit of a hick who on arrival in L.A. had the hick kicked out of her. The wonderful irony is we can tell she is damn sight less hick-ish than she thinks. She gently underlines this with references to artists and art of course. But Maggie is a reader, too, and cites Chandler, Fitzgerald and Ellroy, all authors who dove into the seediest of waters in the L.A. landscape. Like so many book-lovers, she has absorbed the lessons and ideas that great novels so beautifully dissect. This book may not give Hummel, Chandler status. But it is a rollicking and literate ride, with feminist underpinnings but no feminist lecturing. Set in 2003, Still Lives has echoes of #MeToo but Hummel is way too clever to point fingers at Harvey Weinstein types. The book presents a vision of the City of Angels less hellish and depraved than Ellroy’s, for sure. But there is heartache and there is dirt in them hills. There is humour in the novel, as well as gentle teasing of L.A.’s social climbers and would-be intellectuals. All in all, a good read and an intelligent one to boot.